University Medical Center Utrecht and University Utrecht are offering 29 PhD positions focusing on regenerative medicine and stem cells. All positions, fully funded for four years, will be located in the Regenerative Medicine Centre Utrecht, the Netherlands, within the EC H2020 Marie S. Curie COFUND doctorate project RESCUE. The RESCUE researchers will be signed up to the Regenerative Medicine PhD Program within Utrecht’s Graduate School of Life Sciences. You will be trained by different institutes, sectors and disciplines in three main strategic research pillars: stem cell & organoid biology; cardiovascular regeneration; and musculoskeletal regeneration. You will obtain specialist training by participating in cutting-edge research projects, attending specialist training schools and other networking activities, and receiving training in generic research and transferable skills. SCUE is an inspiring, multidisciplinary and translational education program and provides a global training network including over 50 excellent academic and industrial partner organizations. RESCUE aims to shape a new generation of research experts, empowering them to take leading positions in the field of regenerative medicine world-wide. Regenerative Medicine is a dynamic field that brings together fundamental and clinical scientists from many disciplines with the aim of developing novel therapeutic strategies for a wide variety of diseases. Strict requirements for all candidates: you are in the first four years of your research career (no doctoral degree) before the appointment date, you have not lived in or carried out your main activity (e.g. reside, work, studies) in the Netherlands for more than 12 months during the 3 years immediately prior to the application deadline, and you hold an MSc degree (or will graduate shortly) in biomedical engineering, biotechnology, medical/biomedical sciences, neuroscience, pharmacy, veterinary medicine and/or human medicine. Other requirements: You have a strong interest and substantial background and expertise in regenerative medicine and stem cell biology. You possess excellent communication skills and excellent proficiency in the English language (both oral and written), and you are accurate, cooperative, flexible and mobile. An inquisitive mind-set and self-reliance are very important, and you are also enthusiastic, goal-oriented, and have a no-nonsense mentality. 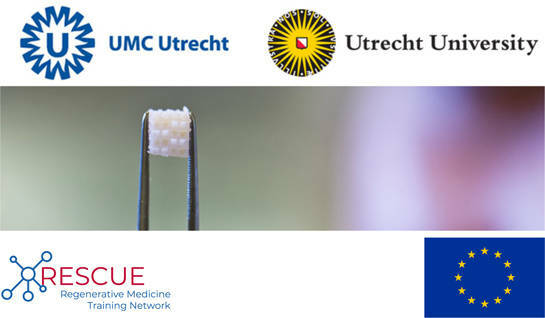 The RESCUE (local training network on ‘REgenerative medicine and Stem Cell technology in UtrEcht) project is coordinated by the University Medical Center Utrecht (UMCU). Together with the University Utrecht (UU), it is offering a unique opportunity to 29 excellent PhD candidates. Utrecht is a young and vibrant city with a large academic population, around 30 minutes southeast of Amsterdam. For this 100% post, the gross salary is between € 2222 - € 2919. This will be a temporary appointment for 4 years, starting with a contract for one year. Start date of employment will be 1 February 2019 (or in any case between 1 January 2019 and 1 June 2019). You can find the obligatory online application form, all relevant information about, the project, the organisations and the different research positions, including the strict eligibility requirements, on our RESCUE website at www.RESCUE-COFUND.eu.